Now then, i’m not usually one for “world music”, despite an abiding admiration for Ehiopian Jazz-Funk, all matters Fela Kuti, the mesmerising Nusrat Fateh Ali Khan, the electro jazz of Dhafer Yussef, and some of Mark Corrin’s recent work, especially with Rose Niland, this niche of the musical business does not really grab my listening attention. However, this little beauty arrived today, and immediately struck a chord. My experience is that attempts to insert the tropes of rock and roll into “ethnic” music is generally doomed to failure. The difference here is that the music is, for the most part, acoustic, not too many of the clinical studio sounds of the mainstream have been applied, and where they have, the fit with the more traditional instrumentation is perfect. This is an album that bucks a trend in attempting to westernise certain ethnic forms which gives it a legitimacy and makes for a refreshing listening experience. Alif is a band of five musicians at the forefront of independent music in the Arab world, and Nawa Recordings is a label dedicated to bringing new alternative music from the Arab world and elsewhere. Formed in 2012 and taking its name from the first letter of the Arabic alphabet, Alif features Khyam Allami (Oud), Tamer Abu Ghazaleh (Vocals/Buzuq), Bashar Farran (Bass), Maurice Louca (Keys/Electronics) and Khaled Yassine (Drums/Percussion). Their self-produced debut, “Aynama-Rtama” (translated as Wherever It Falls) is a described in the promo as a “reflection of its time and environment”. Recorded between Beirut in Cairo in 2014, it is a fascinating album with some very interesting pieces. From the lead track Holako (Hulagu) – featuring a poem by late Iraqi poet Sargon Boulus (1944-2007) rendered into song for the first time – the band marries gritty electronic percussion with traditional instrumentation to create a legitimate marriage of rock/blues/post -punk/elctronica styles with ethnic sounds. The bands’ particular delivery of the tradition of repetition of this form of music aligns itself to modernist elements of post-punk (The Fall, Cabaret Voltaire, Bjork), the pulses of German music (Can,Tangerine Dream, Cluster, Neu!) and to some degree the bleaker elements of some recent Americana. The unique thing here is that such alignments are not so obvious that the listener is immediately convinced that this is not some sort of inane construction in a studio by a producer from Leighton Buzzard sipping a latte in a kaftan, but is instead a valid legitimate and ground-breaking piece of work. Tamer Abu Ghazaleh has a stunning voice and the combination of the various instrumental elements create a sometimes breathtaking sound – “Al- Khutba Al-Akhiri (The Last Declaration)” for example is a delicious mix of soaring keyboards, insistent rhythm and hypnotic vocal melding a motorik journey with the more traditional elements. From the melancholic beauty of Dars Min Kama Sutra (Lesson From Kama Sutra) – which features the work of renowned Palestinian poet Mahmoud Darwish (1941-2008) – to the majestic and surreal album-closer Eish Jabkum Hon? (What Brings You Here? ), penned by Tamer Abu Ghazaleh, each track bursts with rhythmic drive and fervour. The band’s wide ranging influences and potent energy, result in a soundscape that is at once familiar and unknown. Mixed by Ali Chant of Toy Box Studios, Bristol, UK (P.J. Harvey, Rokia Traore, Yann Tierson, Gruff Rhys, John Parish) and mastered by John Dent of Loud Mastering, UK (Bob Marley, Nick Drake, Yann Tiersen, Massive Attack, Nick Cave), Aynama-Rtama is a stand out album in a stand out year for new music. 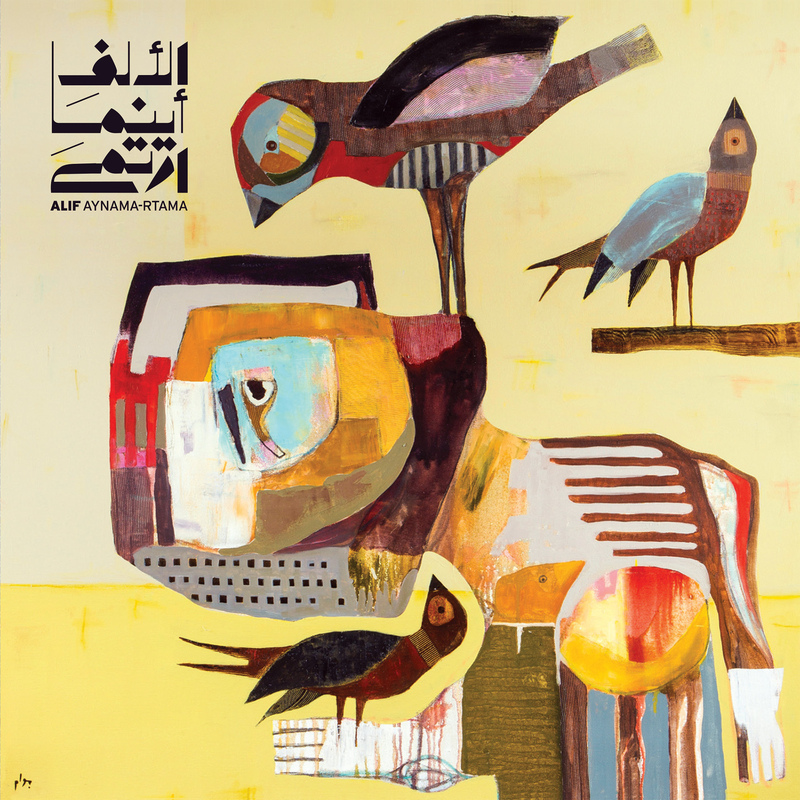 The album artwork features a painting by Syrian-Lebanese visual artist Semaan Khawam. His colourful and surreal paintings combined with original typography by Egyptian designer Salma Shamel perfectly compliment the complexities latent in Alif’s music and lyrics. All editions also feature new English translations of the poems and lyrics by Nariman Youssef which, in their own part, add to the enjoyment and discovery of this music. It will be available on CD, black & limited edition red coloured 12” Vinyl LP and download, including Mastered for iTunes and lossless high-definition 24-bit/96kHz audio files, the first time for a production from the Arab world. Digital pre-orders are available via iTunes and Bandcamp with the album’s lead track Holako (Hulagu) offered as an immediate download. Preview the tracks Lullaby and Holako via the links.